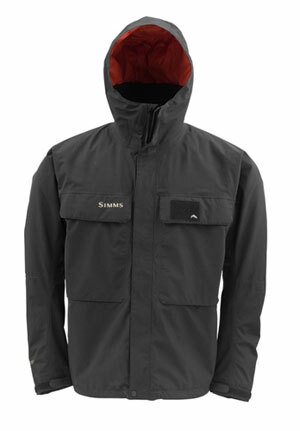 Simms Bulkley Jacket – After several weeks of deep winter wading on Michigan’s Pere Marquette, this jacket impresses. There are some wonderful things about Great Lakes winter steelhead fishing: the solitude, the scenery, the starkly beautiful fish. There are also some not-so-wonderful things: ice-nuggeted guides, frozen reels, hypothermia, and tissue damage. It was with a mind to decrease the threat of long-term bodily harm that I decided to try out Simm’s insulated wading jacket, the Bulkley. I was pretty suspicious. If there was one thing I knew about insulation, it was that you don’t get it wet. A synthetic down is not something I would have chosen to fill a wading jacket destined to spend a good portion of the live-long day submerged. Still, I made it a point to keep an open mind: with the exception of discontinuing their bootfoot waders, Simms has made some pretty good choices over the past few years. 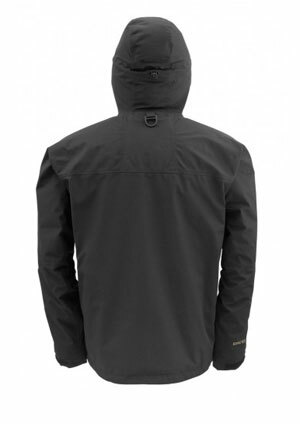 The jacket attributes its magic to Primaloft, a breathable, water-resistant microfiber designed for the military in the 1980s as a solution to down’s loss of loft, and thus warmth, when wet. The fiber’s latest incarnation, Primaloft ONE, allegedly bests natural down by maintaining 96% of its insulating capacity when wet. But does it really? After submitting this jacket to several weeks of deep winter wading on Michigan’s tribs, I have my answer, and it’s a big, shelf-ice rattling yes. True to touting, the Primaloft is incredibly water-resistant. Even after deep wading situations, the only way you’ll know the down is moist (the word “wet” doesn’t really apply to Primaloft) is if you unzip the jacket and check. Your body temperature will not change. I repeat: your body temperature will not change. It also dries remarkably fast. Hang it up inside-out after a day’s fishing and it will be dry before you go to sleep. By next morning it’ll be parched as a duck in the desert. I was also impressed by the amount of heat such a thin layer of down could trap (and it really is a thin layer—this is not a bulky jacket by any means). The Primaloft will boost the efficacy of your other layers by an order of magnitude. Getting dressed for January steelhead used to be a dark and complex art, but for me it now consists of two options: Temps between 28 and 40 get a thin polypropylene jogging shirt and the Bulkley. Temps below 28 get a second layer in addition to the Bulkley—either a loose fitting, mid-weight merino wool turtleneck or light Patagonia down sweater. I personally cannot imagine conditions where a fourth layer would become necessary. Fourth pair of gloves? Yes. Another shirt? Nope. In addition to the nature of the insulation itself, Simms also deserves kudos for choosing to distribute it through the arms and hood in addition to the core (a few similar jackets on the market don’t do this). The insulated hood is an especially invaluable tool for regulating temperature. Getting cold? Put it up and it traps a substantial amount of warmth in a very important location. Getting hot? Drop it down for instant refreshment. The verdict? This is a great jacket and a game-elevating steelhead tool. In winter especially, success hinges on the ability to sustain an intense focus over the course of a full day, and this ability becomes fatally compromised when you’re wondering whether you’ve got enough hot blood to make it to your take-out. Start short-changing your hang-down time or skipping drifts and you’ve made a hard sport that much harder. The Bulkley has allowed me to be a more deliberate, patient, strategic angler—mostly because my body doesn’t slip into survival mode after lunch.